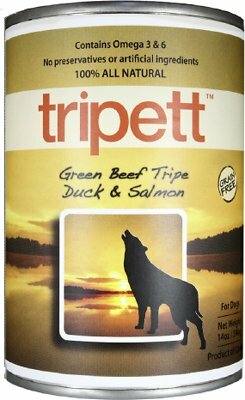 Tripett Green Beef Tripe Duck & Salmon is a grain-free product consisting of nearly 100% pure meat and tripe (green beef tripe, duck & salmon). Green beef tripe is the unbleached, nutrient rich stomach lining of a grass-fed animal containing essential fatty acids and digestive juices important for your pet’s health. Duck & Salmon are highly palatable and rich in omega’s 3 & 6. This product is often used as an added boost for Skin+Coat condition, and variety of protein. Tripett. Feed well. This grain and gluten-free, limited ingredient food is crafted from only 6 ingredients. It's prefect for pets that have sensitivities or allergies to common foods. Beef tripe helps restore balance to your pet's stomach and improves digestion. It's a great choice for any life stage including growing puppies. Helps to promote cleaner teeth, a healthy, lustrous skin and coat, and can help put a spring back in your elderly dog's step. A great option for those picky eaters who get bored easily. It introduces a new protein to your pup's diet and helps switch things up. It's also great for transitioning to a new food. Green Beef Tripe, Water, Duck, Salmon, Garlic, Guar Gum. A 5-10 day transition period is optimum. Start by feeding 80% of their old food and 20% of PetKind. Each day, increase their portion of Petkind by 10% while decreasing their old food until 100% of their meal consists of their new food. PetKind is committed to superior quality when it comes to your dog’s nutrition. That’s why their products focus on 100% pure green tripe and tons of fresh meat. PetKind’s dog food recipes are carefully formulated to provide your pup with everything they need for a happy, healthy life. Like human superfoods, green tripe is naturally packed with benefits for your dog’s health and wellbeing. This essential ingredient features omega-3 and 6, as well as seven naturally-occurring amino acids that help support your best pal’s joints, cartilage, muscles, growth, and so much more. PetKind food is filled with fresh, natural ingredients that your pet will love and naturally crave. Proudly produced from top quality suppliers in Canada, PetKind makes green tripe and fresh meats the highest percentage of every recipe, both wet and dry. Plus, all their food is gluten-free and grain-free, and never contains corn or soy, so you know you’re providing your dog with only the best. All of the benefits—none of the fluff. With PetKind, your pal gets the right mix of delicious, nutrition-packed meals. PetKind products feature a wide range of high-quality tripe formulas, including venison, lamb, beef and bison tripe, plus fresh ingredients like wild Pacific salmon. Welcome to the family. Founded by 3 brothers, PetKind is committed to the health of your four-legged family members. They’ve been producing exceptional dog food in Canada since 2001. They know the impact that fresh ingredients can have on the lives of dogs and cats, which is why they only use the best, sourced from top quality suppliers in Canada and New Zealand. The team at PetKind is passionate about helping pet parents provide their furry family members with a healthy, active and full life. not sure if this product is just old - the cans were not full, a few of them had a lot of pressure built up in them and my pups did not want there food as much as though to tell me something was wrong. Chewy is great though, they reimbursed us the cost of the cans. 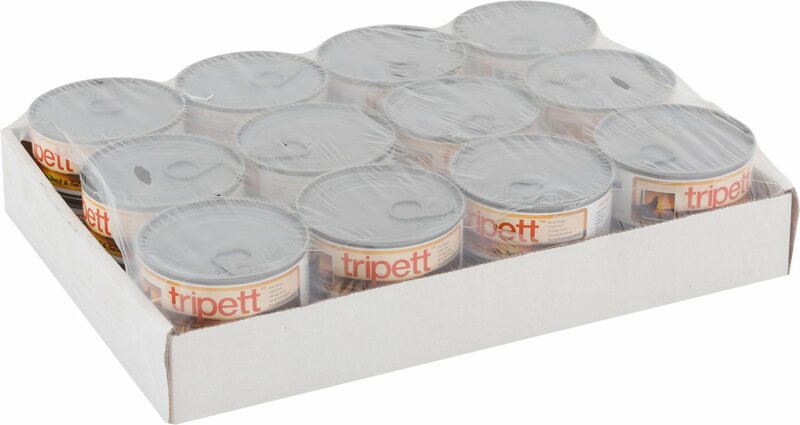 Will not be buying Tripett again through Chewy. I bought a can from a recently opened pet store and the can was full, packed and seemed "fresh" compared to what I had bought from Chewy. My black lab started to refuse to eat his regular kibble even with tasty additions like chicken or rice. The vet discovered a kidney infection and prescribed a renal kibble which he refused as well. Then we found Tripett. He loves it and will eat any thing if mixed with Tripett. So relieved! I was told by a friend to try this product again as we tried the beef one a few years ago and it did not agree with one of my Aussies. The health benefits of green tripe is what made me decide to give it a whirl again, and try the duck and salmon version instead. Well once again I am let down. I have now opened three cans and all three cans are 1/3 or more of nothing but a weird gummed up gelatin! Only 2/3 or less is actual food! The good news (and the reason for two stars) is this combo of food seems to agree with all three of my Aussies. No upset tummies. Unfortunately, for the cost and the amount of actual food in the can I don't think we will be purchasing again. Smells but dogs LOVE it and that is what counts!!! I used to be a part of a raw-feeding co-op where I could get wonderful raw green tripe blends (with muscle meat, organ meat, bone etc.) It was the absolute best food I ever fed my dogs. Unfortunately I moved to a place where I can't get good affordable raw anymore so I was very happy to find this. It's nutritionally very good and my dogs love it. It's not meant to be the sole food you feed but, mixed, with a good kibble, is a very good diet. I have used many of this companys products for many years. Dogs always enjoy them for their enticing flavor and I love the nutrients they're getting. I'm dealing with a Liver compromised 14 yr old dog and this food is helping him thrive, it's easily digestible and produced by a trusted company. My dog does great on this food. Best price I’ve found as well. Our Kodi loves the tripett tripe. He has had all of the different tastes, and drools every time he knows he is getting some in his food. I put it in his food, add a bit of water to better mix it and he is in doggy heaven. It all does stink, but is worth it to aid in his health and overall well being.